On landing in rain the 737 overran the end of the runway at Nampula Airport, Mocambique. All on board escaped without injury. The aircraft landed amidst intense rainfall on runway 05 at Nampula Airport but failed to stop in time before the end of the runway. Having slowed down to moderate speed, the 737 departed the end of the marked runway coming to a stop with all gear on the paved overrun safety area. A number of runway lights were damaged. No injuries have been reported among passengers or crewmembers. All later deplaned via mobile airstairs. There was no damage to the aircraft. 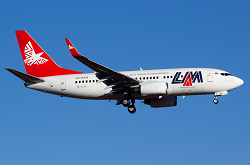 Nampula Airport offers a single active runway of 2000 meters in lengh. 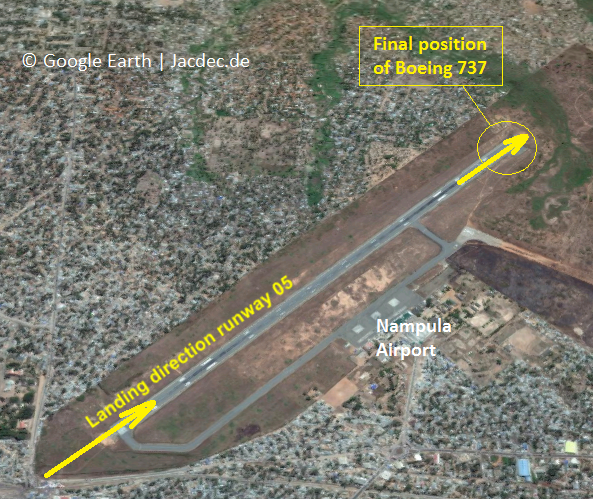 Nampula Airport is not equipped with an instrument landing system (ILS). 2nd safety occurence a Nampula Airport, Moz.